Another ZAA Instructor’s Seminar has come and gone. Mushinkan Dojo would like to thank Noble Sensei and all the Teaching Committee members for the great instruction in both how to perform techniques and how to teach. I cannot say enough about the caliber and quality of everyone who attended. Our time on and off the mat strengthened our connections and friendships. As always everyone of us gave our attention and sacrificed time to make the seminar awesome. Mushinkan Dojo also has the great pleasure of announcing that Seth Lindberg was promoted to Shodan this weekend. Mushinkan Dojo is thankful to Seth for his years of dedicated practice and help developing the Dojo. 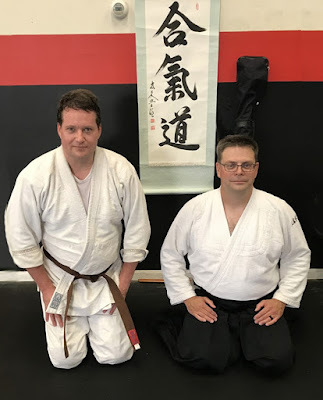 Greg Tetsuzan Noble Sensei is the Chief Instructor of Zenshinkai Aikido Association. He began his Aikido training at the early age of fifteen, and is now ranked Rokudan (6th degree black belt) Aikikai. He also holds black belt ranks in Muso Jikiden Eishin-ryu Iaido and Shindo Muso-ryu Jodo, and has long-term formal training in Zen. Noble Sensei is a certified Zen Teacher and Roshi under Zen Garland, an international organization for Zen training, and is Dharma Successor of Paul Genki Kahn Roshi. The study of Aikido weapons is paramount to our understanding of the aspects of distance, timing, body movement and intensity within our practice. At this seminar we will cover the ZAA weapons curriculum at all levels. 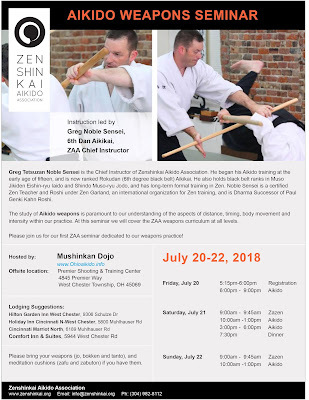 Please join us for a ZAA seminar dedicated to weapons practice!